This section of the web site is incomplete and tentative. That is because I am a photographer and mountain-lover, rather than a historian. There is little of the history of the Road on-line, and I have found very few written pieces elsewhere. The foremost source of authoritative information is the 50 year anniversary book about the Road (see the books section of the Links page). As I said on the Home page of this web site, I am more than open to receiving comments and corrections. Please share with me what you know! The Great Dolomite Road, as it has come to be known in English - the Strada delle Dolomiti as it is called in Italian, and the Dolomitenstrasse, as it is to the many local German speakers and visitors - was completed in 1909. 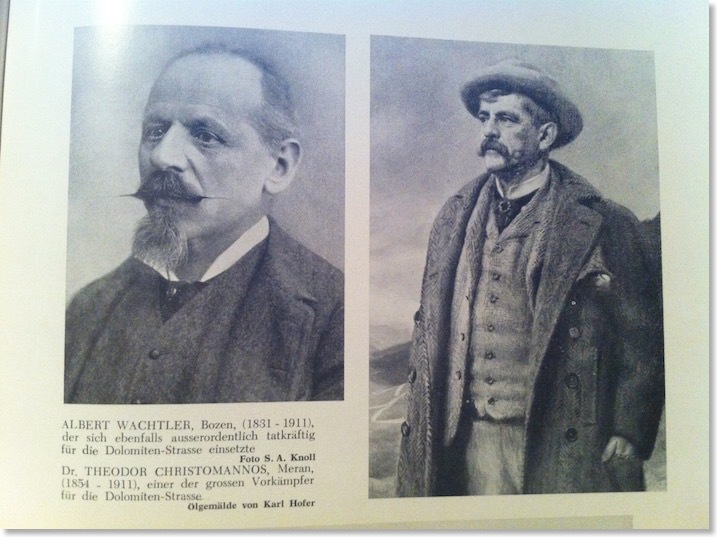 The Road is reputed to have been inspired by ideas of Theodor Christomannos, a Tyrol patriot, and Albert Wachtler. Christomannos is said to have held the view that there would be “no hotels without roads, and no roads without hotels”, and no tourists without either. The Road has always been synonymous with tourism. Christomannos wrote the first guidebook to the Road, in 1909, which was reprinted in 1998 (see the Books section on my Links page). There not, to my knowledge, any on-line histories of The Road. There was a flurry of interest around the centenary of its completion, in 2009, but most of the pages that appeared have since been taken down or moved to locations I have been unable to find. If you discover one, do let me know, please! The work on the Road as a continuous route appears to have begun in 1901. I have read suggestions that this was envisaged as a military road. This is credible, as much of its route is within the former Austro-Hungarian Empire, and close to the then border with Italy. During the World War 1 fighting in the Dolomites, much of the road, particularly above Cortina, was on, or very close to, the literal front line between Italian and Austrian troops. The present-day Italian border, some way further north of where The Road runs, has only existed since 1919. The Great Dolomite Road also links to other strategically significant road passes of a similar era, such as the Passo Valparola, from Corvara to Falzarego and Passo Costalunga from Corvara to Arabba. The last part to be put in place was apparently a section over the Falzarego Pass in June 1909, and the Road formally declared open by Kaiser Wilhelm on 13 September 1909. The start of work on the Road pre-dates significant motor-driven transport. Accommodating its needs would probably not therefore have been a priority in the design of bends and overall gradients. Records show the first car driven to Cortina, for example, was driven from Innsbruck in 1894, but cars would have remained a rarity on these roads for many years to come. The Road has seen, and continues to see, improvements to keep its traffic flowing. Zardini’s own photographs show evidence of motor traffic on it by about 1920. The road remained predominantly surfaced with stone and gravel, as a classic Italian “white road” (strada bianca) until well into the 1950s. This is one reason it stands out so well on old photographs, compared to modern equivalents. Several photos on this web site show this very vividly. It would be wrong to regard what was being planned from about 1895 and built from May 1901 all as being new road. Old guide books and maps make it very obvious that much of the route already existed before then, though a great deal of it would have been little more than well-used mule and car tracks. A few areas had old roads and tracks that ran parallel to the Great Dolomite Road, but much of its exact line was new. In the case of some of the links it established there may have been little natural connection between some of the valleys it now joins. 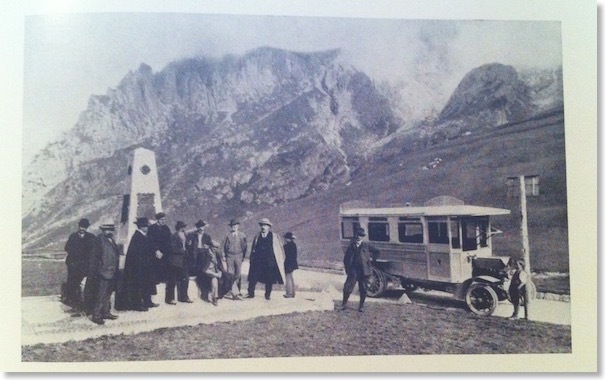 The memorial at the summit of Passo Pordoi commemorates the completion of the Road in 1909 (see Photo 15) The principal engineers Vittorio Dallago and Alfredo Riccabona are celebrated on the Pordoi plaque along with contributions from Gualtiero Adami, Ermillio Boggio and Nicola Vettori. 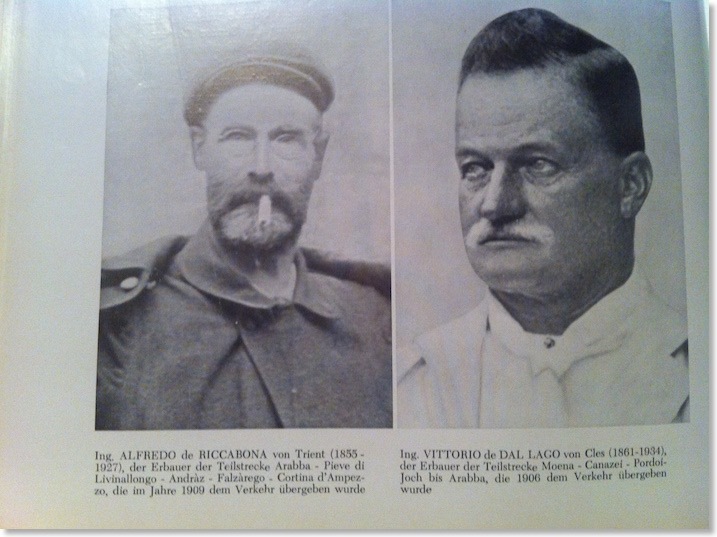 There are occasional references to these men on the internet, such as this, which includes portraits and this, relating to Riccabona I also own a book in which the engineer Dr Ennio Ortolani describes his involvement with the project. So, who was “A Zardini”? I have not researched the Zardini family in detail, but in January 2016, I was given the link to this series of web pages about Antonia Verocai Zardini. I am in no doubt now that she is the photographer principally responsible for the booklets about The Great Dolomite Road. 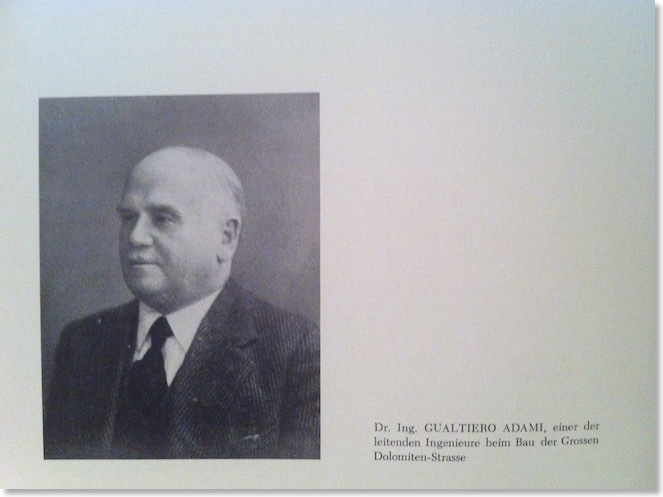 The article includes one photo that appears in the booklets. There are many examples of Zardini photographs still around. I have obtained several sets of postcards and little boxes of souvenir photos over the years, and there are a few books of photos. I have added a few notes in the Links section of this site. The Zardini line continues to this day. The output of Stefano Zardini is prolific. He is, in my view, one of the top photo-reporters and adventure photographers in the world.